Are you at all surprised that these homemade spiced sugared cranberries are making an appearance this holiday season? I mean, they are just so sparkly and fun! And this year, I made us a cake to put them on! A chocolate almond olive oil cake to be exact. Fudgy, chocolate-y, dreamy. Plus, how can you not smile by just looking at this pretty little number? Holiday cheer to the max! I wanted to get this recipe up now since I think it is fantastic for both Thanksgiving AND Christmas. So if your Thanksgiving menu is already planned (Ha! Can we talk about how behind I am this year?? ), just go ahead and make it during the merry and wonderful time that is Christmas baking season. Yes? And then enjoy it on the couch with some Christmas music and decorations galore in the background. Or! Go ahead and make it for turkey day! And have it be the stunner of your dessert spread. Seriously – I cannot get enough of that sparkle. And I haven’t even gotten to the best part yet. While the cake definitely looks impressive, there’s nothing at all fancy about whipping it up. Yes, you do have to make the cake, frosting and cranberries, but each step is nice and simple, I promise! The end result? We have that slightly fudgy chocolate base. A layer of perfectly light and creamy coconut milk frosting (spiked with almond extract – swoon!). And then those sweet and tart cranberries which are the perfect contrast to the rich base. Holiday happiness! So, today’s cake is coming atcha’ in partnership with Bob’s Red Mill. I think at this point you know how much I adore this company and their products, and the fact that I genuinely buy so very many of their items on a regular basis to use in my kitchen. For this chocolate cake, we are using not one, but two of their flours. Their Organic Unbleached All-Purpose White Flour, which is super versatile and perfect for all your holiday baking needs. It helps keep the cake from getting overly heavy. And, we are also using their Super-Fine Almond Flour, which is ground from whole, blanched sweet almonds and adds the perfect touch of nuttiness to today’s baked treat! So, like always, let’s now get to some tips & tricks for the recipe. Be sure to plan ahead for the coconut milk frosting! The can of coconut milk needs to be refrigerated at least overnight in order for the cream to harden and separate from the liquid. On that note, every so often I’ll get a bum can of coconut milk, where the cream just doesn’t separate (which is totally fine for other recipes, but not here!). So, I like to keep an extra can in the fridge at all times just in case this happens. You can substitute lightly packed brown sugar for the coconut sugar if desired. Like with most baking recipes – keep in mind that all ovens are different. Keep an eye on the cake and check for doneness with a cake tester. 33 minutes is perfect in my oven – the cake is done but not over-baked (which will dry it out). If you do happen to under-bake the cake – the center may sink a bit after removing from the oven. Don’t panic though! You can cover that right up with the frosting (and let’s be honest, the cake is so crazy fudgy this way that I’m not sure it’s a bad thing??). I personally think this cake is best at room temp. However, because of the coconut milk, it needs to be stored in the fridge (in an airtight container) once frosted. So. Just keep that in mind. You can serve it cold … or let it come back to room temp. Or! Just frost right before serving and sprinkle on those darling cranberries! And be sure to visit Bob’s Red Mill for an awesome coupon to help get ready for the season. Holiday baking here we come! A fudgy chocolate almond olive oil cake topped with coconut milk frosting and spiced sugared cranberries! Dairy free and oh so festive for the holidays! Preheat the oven to 350ºF. Line an 8×8 inch baking dish with parchment paper (cut a big enough piece so that the paper hangs over the edges of the pan on two sides). Spray lightly with olive oil or nonstick cooking spray and set aside. In a medium bowl, whisk together the flour, almond flour, cocoa powder, baking soda, baking powder and salt until well combined. In a large bowl, whisk together the eggs, sugar, oil and milk until well combined. Add in the flour mixture and mix until just incorporated. Fold in the dark chocolate. Transfer the batter to the prepared pan and spread evenly. Bake for about 30 to 35 minutes, or until a cake tester inserted into the middle comes out clean. Set the pan on a wire rack. Let the cake cool completely, then use the parchment overhang to carefully lift out of the pan. Place a medium-sized mixing bowl in the freezer for 5 minutes to chill. Open the can of coconut milk and scoop the hardened coconut cream into the chilled mixing bowl (leaving behind the liquid – save this for smoothies!). Using a hand mixer, whip the cream until fluffy. Add in the powdered sugar and almond extract and whip again until incorporated. Spread the frosting gently over the cooled cake. Top with the sugared cranberries as desired. Once frosted, the cake must be stored in the refrigerator (in an airtight container). Wait to top with the sugared cranberries until just before serving (i.e. don’t put them on the cake if putting in the fridge! The sugar will sort of melt off them from the frosting!). Be sure to use dairy free chocolate chips if needed for your diet. This post is sponsored by Bob’s Red Mill. However, all opinions and content are completely my own. As always, thank you for reading and letting me share brands that I love! What a beautiful cake! Love those cranberries! Yay the cranberries are back this cake looks so good I want a slice right now…. Those cranberries look so gorgeous and the flavor of the cake sounds incredible. I need to start baking with olive oil! This just screams HOLIDAY to me!! I love how pretty it will look on my dessert table. Oh, and Bob’s Red Mill is the best! This is such a beautifully festive cake! Love those cranberries – they’d transform any dessert this holiday season into something gorgeous. I ran out of oil while making a cake recently and used olive oil. SO GOOD. This cake sounds so good! They really do! I’ve been itching since last year to make a cake to put them on! haha Thanks Alyssa! I absolutely adore beautiful sparkling cranberries, and this gorgeous cake is the perfect vessel to pile them on! Chocolate, almond and olive oil sounds like a beautiful flavor combo. Dying for a slice! this looks delicious! love that topping…what a great base for those cranberries. yum!! This cake sounds so creative! And very festive for the holiday season. I’m always up for chocolate cake… it’s one of my favorite desserts! Wow this cake sounds absolutely magical! Loving the ingredients— definitely adding it to my list for the holidays! This looks so good and perfect for the holidays. I’m really loving the sound of the spiced cranberries and coconut frosting together! This yummy cake definitely brought a smile to my face 🙂 I love coconut milk frosting and that you can make this for Thanksgiving or Christmas! The sugared cranberries are the perfect touch and so so pretty!! Well you know my Thanksgiving dinner isn’t planned.. well it is, but the restaurant is planning it! Ha! BUT, I’m thinking I NEED to make a dessert for us to enjoy when we get back home and put on our pj’s. And I’m thinking this sparkly little number would be PERFECT! I’m pretty obsessed with sugared cranberries (because SOO pretty), so I LOVE that you used them here! Boy would go crazy for the fudgy chocolate cake base!! And I might just eat the coconut and almond spiked frosting with a spoon! Fabulous dessert, Ashley!! Pinned! Cheers! haha I mean, you planned going out right?? 😉 Totally counts! Thanks lady! YES I love the sparkle!! I just made sugared cranberries for the first time a few days ago and have been popping them like crazy. They make everything prettier and I think they would give this cake such a nice little tart pop of flavor! I love Bob’s Red Mill products, and can’t wait to give this a try! They are addicting!! Thanks Marcie! Okay, now I know you made this specifically for me, right! ; ) This has my name written all over it…from the chocolate to the almonds! And I love that coconut milk frosting! I’m dying to try that. This really is a gorgeous dessert, perfect for Thanksgiving or Christmas. Love it! Thanks Gayle! I’ve recently become obsessed with using olive oil in baking! So very festive and beautiful and I bet it tastes fantastic too, Ashley. Oh my gosh, this cake!! 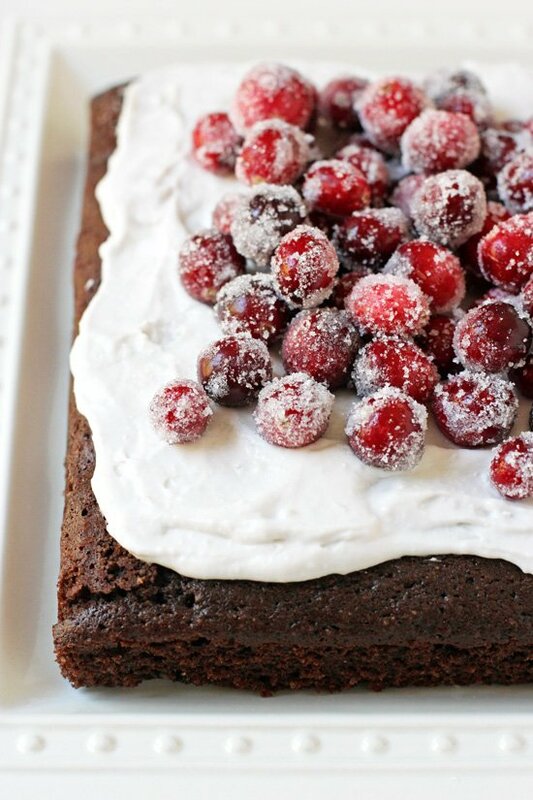 I’m seriously in love with how ultra-moist it looks and those sugared cranberries just make everything so pretty! Total holiday food right here! O that sweet frosting with the deep flavors of chocolate and olive oil…on point, my friend!